Bringing a new life into the world is an event like no other, and My 1st Years offers you the chance to mark this occasion with a uniquely personal gift. 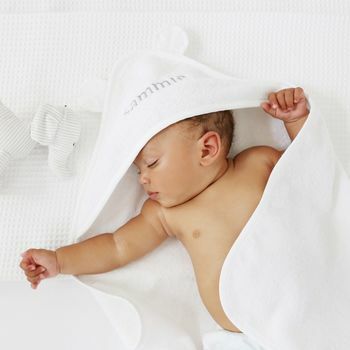 Whether you’re looking for a classic teddy bear, a warm knitted blanket or their first pair of high top trainers, our carefully selected range allows you to shop quickly and effortlessly for that perfect newborn present. The My 1st Years team stand apart in our personalisation expertise, which we have perfected over the course of several years. Our lovingly made collection comes with the option of being embroidered, flocked, printed or engraved with a special someone’s name or customised message; a service which - along with our luxury gift boxes. We believe each and every child deserves a one-of-a-kind memento which can become part of a treasured memory. "Absolutely gorgeous present for my boyfriends new baby nephew. Came in the most gorgeous gift box. So happy with this product." "Beautiful towel, very good quality and my friend who received it said it was the best gift she had received for the birth of her son." "The personalised robe is so cute really well made and was well received. The packaging alone was just so precious comes in a perfect keep sake box!"